Well, I guess the first lesson (if you can call it that...since it wasn't a lesson for me per se) is to always make sure your DVR is running well past the estimated end time of a game. I know this lesson, I really do. Normally, I'm good for at least an extra hour of recording a game. Two, if I'm feeling particularly nervous. I thought I had done this, but realized I did not and ended up missing the final few minutes. At least things turned out well. 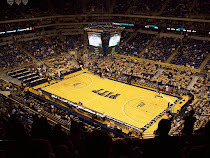 Lesson #2 - Before I get into the game specifics, let me say how incredibly annoyed I am whenever Pitt beats a higher-ranked team at home and it's called an upset. Please. Jamie Dixon is STILL undefeated (6-0) against top five (not top 25, top five) teams at home. Pitt just doesn't lose at home and even playing the #1 team, the game should at least be a push. Announcers and writers still haven't learned this lesson, somehow. To start, it was a record crowd at the Pete. 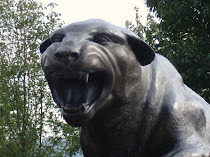 Plus, it probably didn't hurt that Pitt's Junior Day for recruits was today (subscription required). Pitt pulled out a 70-65 win against fourth-ranked Villanova today - giving them their second straight loss for the first time in almost two years. Let's not get crazy, this game did nothing to wipe out even a little of the pain Pitt had in losing that game last year, but it was a nice win for them THIS year. One of the things that jumped out at me was Pitt's determination to hold off Villanova runs. The latest lead Villanova had was 9-8 with about 14 minutes left in the first half. Several times in the second half they got close, but never got over the hump. - With ten minutes left, Scottie Reynolds hit a three to cut the lead to two. Pitt responded with a 6-0 run. - When Antonio Pena got Nova to within two with about five minutes left, Pitt scored the next two baskets. - When Nova then hit a three to cut it to three, Pitt made three free throws. Pitt just had an answer every time. Here are the quotes from the post-game press conference, though nothing extremely significant here. Jay Wright continues to be one of my favorite Big East coaches as he's just a classy guy. Not one mention of officiating though, truth be told, I think he had some legitimate gripes in that area. One thing that's getting to be more than just an annoyance is Gibbs missing free throws late. He had made nine straight during the game, but missed three in the final :45. It's not as if the game was over at that point and Pitt really needs him to be able to make those at the ends of games. With two games to make up and only four to play, I think a Big East title is incredibly remote, but when you look at what they've accomplished this year, it really is pretty amazing. Pitt needs to focus on getting a top 3-4 seed in my opinion. I'm going to hit on this in a later post.